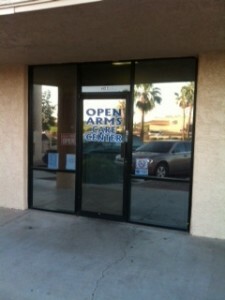 Open Arms Care Center is a faith based non profit organization located in Gilbert Arizona. Our mission is to serve the growing Gilbert community by providing supplemental food and clothing to those in need regardless of age, race, religion, or national origin. The Open Arms Care Center began as a ministry of Sun Valley Community Church in January of 2000 for the purpose of providing food for the needy. In 2001 it became a separate nonprofit organization with a vision to add perishable foods and a clothing closet, and to include volunteers from other churches and the community. Open Arms is the only agency of its kind in the Town of Gilbert providing food and clothing to the homeless and less fortunate people in this growing community. Currently over 1,500 people per month are being assisted. First United Methodist Church of Gilbert works with Gilbert Open Arms in many different ways. When you grocery shop for youself and your family, pick up a few extra items and drop them off at the Mission table. Pick up a “Menu of the Month” from the Mission table and purchase those items when you are out shopping. Then bring them to the Mission table on Sunday and drop them off. We collect for Gilbert Open Arms all year long, so you can bring in items to donate at any time. For more information about Gilbert Open Arms, please email the Missions Team.